Bernard Baruch was an American financier, stock investor, philanthropist, statesman, and political consultant. 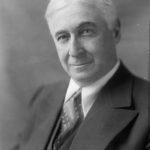 After his success in business, he devoted his time toward advising U.S. Presidents Woodrow Wilson and Franklin D. Roosevelt on economic matters, and became a philanthropist. "To me, old age is always fifteen years older than I am." "Vote for the man who promises least; he’ll be the least disappointing." "Millions saw the apple fall, but Newton was the one who asked why." "Let us not be deceived we are today in the midst of a cold war." "The art of living lies not in eliminating but in growing with troubles." "There is something about inside information which seems to paralyse a man’s reasoning powers." "In the last analysis, our only freedom is the freedom to discipline ourselves." "The greatest blessing of our democracy is freedom. But in the last analysis, our only freedom is the freedom to discipline ourselves." "If the history of the past fifty years teaches us anything, it is that peace does not follow disarmament – disarmament follows peace." "Age is only a number, a cipher for the records. A man can’t retire his experience. He must use it. Experience achieves more with less energy and time."